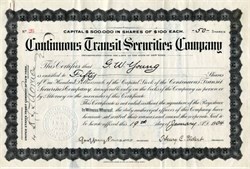 eautifully engraved certificate from the Continuous Transit Securities Companyissued in 1904. This historic document was printed by the American Banknote Company and has an ornate border around it with the company's name on top. This item has the signatures of the Company’s President, Henry C. Elder and Secretary, G. Parsons and is over 106 years old. Paper clip mark in upper left corner. The Continuous Transit Securities Company, of New York city, was been incorporated in 1903, with a capital of $500,000, in New York, to equip street railroads with continuus moving platforms on railroads. The city of New York requested that the Continuous Transit Securities Company submit a proposal to the Public Service Commission for the privilege to build a subway under Broadway from Fourteenth to Forty-second streets and to equip it with a continuous train or moving platform railway. The moving platform would require a right of way of only 35 feet, although its capacity would be twice as large as a four-track subway. The proposed platform would afford a seating capacity exceeding 47,000 passengers an hour in each direction. This is three times the seating capacity of a train system operating five-car local trains upon one-minute headway, and practically sixi times the seating capacity of a system of surface cars operating upon 150-foot headway.